Below is an overview of 3Play Media's turnaround service levels. 3Play Media's business hours are Monday through Friday, 8am to 8pm Eastern Time, with the exception of Federal US holidays. Scroll to the bottom of this article for a complete list of holidays. Turnaround guarantees are subject to duration maximums. See more information regarding duration limits. This is the default turnaround option and is four business days, provided that your file is uploaded by 8pm ET. For example, if your file is uploaded by 8pm ET on Monday, it will be ready by 8pm ET on Friday. If your file is uploaded after 8pm ET on Monday, it will count as being uploaded on Tuesday, and will be ready by 8pm ET the following Monday. The cumulative duration of all files submitted for Standard service cannot exceed 40 hours in a single day and an individual file cannot exceed 4 hours. If you exceed these limits, we will still aim to complete your files on time, but we cannot guarantee the turnaround. This turnaround is two business days, provided that your file is uploaded by 8pm ET. For example, if your file is uploaded by 8pm ET on Tuesday, it will be ready by 8pm ET on Thursday. If your file is uploaded after 8pm ET on Tuesday, it will count as being uploaded on Wednesday and will be ready by 8pm ET on Friday. The cumulative duration of all files submitted for Expedited service cannot exceed 20 hours in a single day and an individual file cannot exceed 2 hours. If you exceed these limits, we will still aim to complete your files on time, but we cannot guarantee the turnaround. This turnaround is one business day, provided that your file is uploaded by 8pm ET. For example, if your file is uploaded by 8pm ET on Tuesday, it will be ready by 8pm ET on Wednesday. If your file is uploaded after 8pm ET on Tuesday, it will count as being uploaded on Wednesday and will be ready by 8pm ET on Thursday. For one project, an individual file cannot exceed 2 hours and the cumulative duration of all files submitted for Rush service cannot exceed 10 hours in a single day. If you exceed these limits, we will still aim to complete your files on time, but we cannot guarantee the turnaround. This turnaround time is eight hours from upload time, provided that the file is uploaded by 8pm ET on a business day. For example, if your file is uploaded at 9am ET on Tuesday, it will be completed by 5pm ET on Tuesday. If your file is uploaded at 7:59pm ET on Tuesday, it will be completed by 3:59am ET on Wednesday. If your file is uploaded at 8:01pm ET on Tuesday, it will count as being uploaded the next business day, Wednesday, at 8am ET and will be completed by 4pm ET on Wednesday. For one project, an individual file cannot exceed 15 minutes and the cumulative duration of all files submitted for Same Day service cannot exceed 2 hours in a single day. If you exceed these limits, we will still aim to complete your files on time, but we cannot guarantee the turnaround. This turnaround time is two hours from upload time, provided that the file is uploaded by 8pm ET on a business day. For example, if your file is uploaded at 9am ET on Tuesday, it will be completed by 11am ET on Tuesday. If your file is uploaded at 8:01pm ET on Tuesday, it will count as being uploaded the next business day, Wednesday, at 8am ET and will be completed by 10am ET on Wednesday. For one project, an individual file cannot exceed 5 minutes and the cumulative duration of all files submitted for 2 Hour service cannot exceed 2 hours in a single day. If you exceed these limits, we will still aim to complete your files on time, but we cannot guarantee the turnaround. 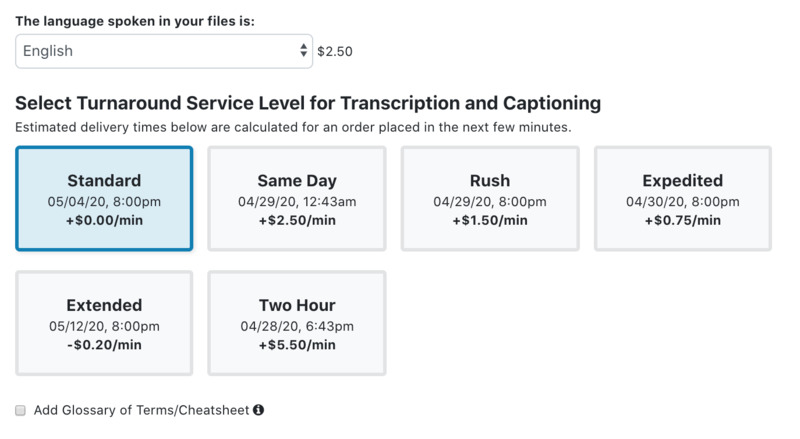 This turnaround level is 10 business days and is a great option for captioning and transcription requests that are not urgent. Individual files should not exceed 4 hours. For one project, there are no limitations in terms of the cumulative duration for all files submitted for the extended service level. Extended turnaround is available when uploading through the account system, via FTP, and through the API. To upload with FTP, create a folder named "extended_service" and upload to that folder. Note: In the unfortunate case that we miss a deadline for a file that met our individual file duration limits, you will only be charged for the service level achieved. Note: If the holiday falls on a Sunday, it is observed the following Monday. The observed date is what is listed below.